Recently, our Rotary Club had a terrific presentation about the future of advertising. We got to meet Virtual Liz. She is an amazingly lifelike interactive image that talks to you and responds to your gestures. Today's Wichita Eagle has a front page story about the new technology created here in Wichita. 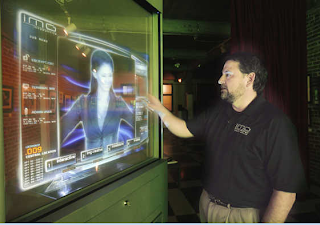 "Virtual Liz," is a creation of Integrated Media Group of Wichita, a company that produces movie scenes (i.e., portions of the movies, "Pursuit of Happyness," "Hancock," "Get Smart," etc. ), commercials, and productions you have probably seen. I believe they are really onto something. Be sure and read the article, it is a fascinating look into the future. UPDATE Monday: I just thought of the perfect use for this: Airline check in. Given how unpleasant many airline employees are these days, a cheerful interactive experience would be a vast improvement. Wow!!! What a game! I was listening on the radio to the basketball game tonight between rival schools Kansas State University and The University of Kansas. I was worn out from just LISTENING to it. It was a one to two point game through the entire second half. And then there was overtime! Both teams played so well, and it made for a great game. With both teams ranked in the top 10, I knew that it would be good, but had no idea that it would be THAT good. Electric demand is highest when it is coldest and warmest for heating and air conditioning, respectively. 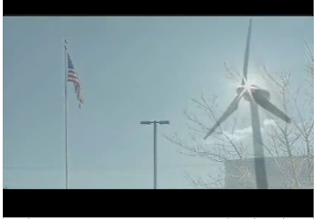 At $300,000 each, these new state-owned wind turbines don't spin when it is cold in Minnesota! Their special "Minnesota winter" hydraulic fluid freezes. So, what is the plan? To heat the hydraulic fluid! Of course, that requires electricity or natural gas which means the net power output from the turbine drops (it wouldn't surprise me if it drops to near zero). Image courtesy KSTP TV and "Hat Tip" to Hot Air. But, "its a great project." 5.5" inches of snow, 0.60" of melted water, all-in-all a beautiful snow. 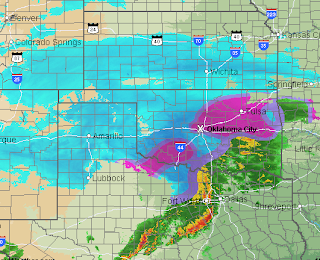 The snow and ice storm continues to move east. 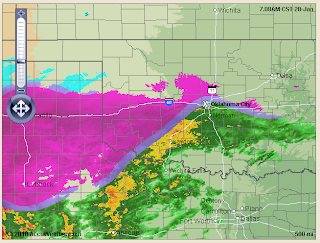 Purple colors = freezing rain and sleet. Shades of blue are snow with darker blues = heavier snows in this AccuWeather MySpace Radar image. It is still snowing in downtown Wichita as this photo from my office window indicates. 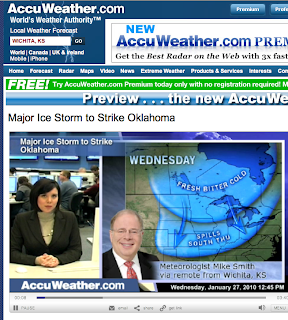 Please stay with AccuWeather's Special Coverage of this dangerous ice storm. When you are warm in bed at 1am as the snow swirls outside, meteorologists for WeatherData, AccuWeather, the National Weather Service, and, probably, your local television station are just getting up to go to work. They battle heavy snow and streets that haven't seen a plow or sand truck (road crews wait until closer to rush hour) to get to work. Once there, they work hard to inform you about the snow and ice storm. They will likely work longer than average hours during one of these multi-faceted storms. TV meteorologists will have the stress of doing extra on air reports. This was posted on my blog Monday. Four days of warning of a major winter storm. Tuesday, we were already informing Oklahomans of major power outages so they could prepare. 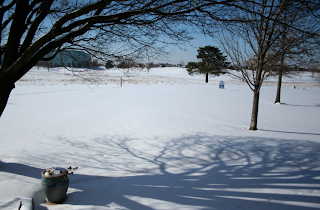 We told one of our electric utility clients in Kansas "no ice here." Because they knew they would not have ice-related outages in their service territory they, proactively, sent crews into Oklahoma to augment the crews of Oklahoma utilities. Unlike storms of the past, today's accurate weather forecasts enables the restoration effort to begin even before the first drop of freezing rain falls. There are roughly 500,000 Oklahomans without power at the moment and every extra crew is vital to get power restored from a huge storm like the one that is now moving out of the Sooner State. As I write these words, our people are having an animated discussion about snow depth forecasts. 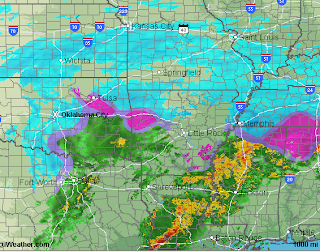 Not only are they handling the snow storm, they are handling the ice storm as it moves across Arkansas and a line of strong thunderstorms in southeast Texas. Few realize the tremendous progress that has been made in meteorology and how much it has enhanced the safety and convenience of our lives. So, take a look at WeatherData's web site to see what we do. Bookmark the AccuWeather web site and look at all of the great forecasts and information we provide. And, drop the local TV meteorologist or National Weather Service office a note and tell them how much you appreciate everything they do for all of us. "Snow Days" are infrequent in Wichita, but today is one. And, on a Friday no less! One of the great joys of my childhood would be when my mother would come into the bedroom and say we could go back to sleep because there was "no school." Sledding in College Hill Park this morning! Dad giving his sons a boost! And, the wonders of modern technology. I remember us crowding around the tv or radio to try catch whether St. Catherine's School was closed (out of the hundreds of schools in the KC area). Now, a text message at 5am comes in and everyone goes back to sleep. I apologize for not getting to the "Daughter of Climategate" scandal on the schedule I originally posted. Between the winter storm, regular WeatherData duties, and more book editing and marketing, I have gotten terribly far behind. I will post it when I can get unburied. CAIRO (AP) - Al-Qaida leader Osama bin Laden has called in a new audiotape for the world to boycott American goods and the U.S. dollar, blaming the United States and other industrialized countries for global warming. Many non-specialists are unaware of a recently-created industry of companies that use sophisticated models to try to predict hurricane losses and losses from other types of storms. In the previous post, I talk about the SEC's nonsensical decision to "encourage" companies to disclose their exposure to 'climate change.' One method of doing that is to use these computer modeling services. While the models can and do provide useful information when a storm is imminent (i.e., Hurricane X will move into location Y with 120 mph winds and a 15 ft. storm surge), they have shown no detectable skill at forecasting losses years (the timescale for "climate") into the future. Another new paper shows this to be the case. Roger Pielke, Jr. has more here. So, if there is no way to forecast the losses caused by storms, how are companies supposed to -- in advance -- disclose their losses? to encourage companies to disclose the effects of climate change on their businesses. SEC Chairman Mary Schapiro, an Obama appointee, said the agency wasn't weighing in on the climate debate and wanted to ensure that investors get reliable information. OK, let me get this straight: Climate evolves over decades and centuries and they want businesses to "disclose" (which implies they know) the "effects of climate change on their businesses" (which means they would have to forecast the weather decades and centuries into the future with a high degree of certainty). Meredith Cross, director of the SEC's corporation-finance division, defended the move, saying large investors wanted the information. "Investors have a fundamental right to know which companies are well positioned for the future and which are not," said Anne Stausboll, chief executive of the California Public Employees' Retirement System, or Calpers, the nation's largest public pension fund. Insurance companies are among those affected by the SEC action. The agency said insurers may want to consider disclosing whether severe weather or changes in sea levels might increase the risk of claims in coastal regions. The SEC also said companies should weigh disclosure on how pending rules or laws might affect the bottom line. For example, it noted, goods that produce significant greenhouse-gas emissions might see lower demand. Peter DeSimone, the director of programs at the Social Investment Forum, said his group will ask the SEC "to intervene and enforce ... in cases where we see there's a clear lack of disclosure." So, to know which companies are "well-positioned" one (to make the point a second time) would have to know the weather decades and centuries into the future. And, for there to be a "clear lack of disclosure," it means there has to be something (like an accurate 15-year weather weather forecast) to disclose. I don't write about politics. So, let me say in a non-partisan manner: This decision is just dumb. The major winter storm continues to unfold over the southern Plains and will move into the Ozarks tonight then into across the Tennessee Valley by Friday night. Power failures are widespread between Norman and Ardmore, OK through southwest Oklahoma into western Texas. We have received reports of hundreds of power poles brought down by the ice. The OKC airport is closed. Over the northern half of the Texas Panhandle, snow amounts of 5 to 9 inches have been reported with as much as 6-8 inches of additional snow likely to fall. With winds gusting to 40 mph, there are drifts reported to 2.5 feet. To the south, a line of thunderstorms is currently moving through Dallas-Ft. Worth causing flight delays and strong winds. Wind damage was reported west and southwest of Ft. Worth earlier this afternoon. The ice storm will move across the northern half of Arkansas into western Tennessee tomorrow with heavy snow across southern Kansas and southern Missouri. AccuWeather is providing special coverage on its main web site and blogs. Check it out! As of 1pm, I-40 is closed across the entire width of the Texas Panhandle and into western Oklahoma. All major roads in the Texas Panhandle are closed. Ice storm continues in Oklahoma. Power outages and lines down in southwest Oklahoma. Freezing drizzle possible late tonight in northern parts of D-FW Metroplex. Line of strong thunderstorms moving into Central Texas. Tornado warning southwest of Ft. Worth near Stephenville. Full details at AccuWeather. 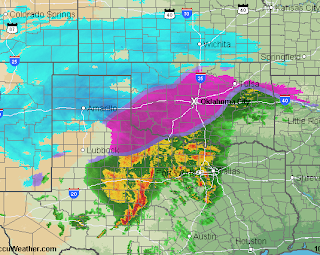 At 7:13am, the major winter storm is rapidly developing over the southern Plains and is spreading east and north. The purple shades are ice! This is a very serious storm that will cause power interruptions and road closures. Please plan accordingly -- there may be power outages in Oklahoma and the southeast Texas Panhandle that will last for days. UPDATE 8:48am: Power failures are now being reported in southwest Oklahoma. Interstate 40 is blocked by an accident in far western Oklahoma. It is likely that I-40 will have to be closed before the day is over. I-35 and I-44 will see seriously deteriorating conditions as the day progresses in Oklahoma and there is a chance they will be closed, also. Some strong thunderstorms may occur in south Texas. Future updates available at AccuWeather. We will be updating our coverage throughout the day. We are testing some blog software, so I thought it would be a good time display an advertisement for my book. Click on it to order! If you pre-order from Amazon, you will get the lowest price they set on the book which will likely be less than $24.95, but we have no way of knowing the price their algorithm will set. We will be offering inscribed, autographed copies on my web site at Mike Smith Enterprises . We have not set the ordering system up as yet, Kim or I will let you know when we do. The price for the autographed copies will be $30.00 which includes tax and shipping. So, you'll be able to purchase it at Amazon, your bookstore, or autographed from us. Whichever you choose, we are thrilled by your interest and hope you enjoy it when it is published. Kate Bilo at AccuWeather HQ and I discuss the major ice storm forecast for Oklahoma along the with heavy snow that will likely affect northern Oklahoma and southern Kansas then east into the Ozarks. Click here to view the report. I-35 between Wichita and Dallas and I-40 between Ft. Smith and Amarillo will see seriously deteriorating conditions tomorrow and tomorrow night and there is a possibility that both roads may be closed. Please plan accordingly. One of the things I like about Greensburg is its plucky spirit. 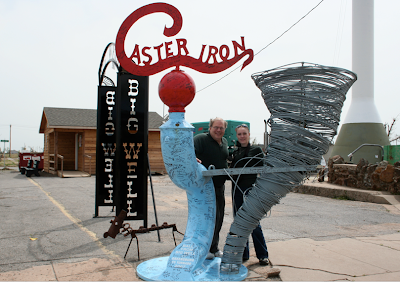 I was emailing on this topic with my brother this morning and I recalled that, in addition to the wire tornado in front of the World's Largest Hand Dug Well (see below), is the "tornado swing." 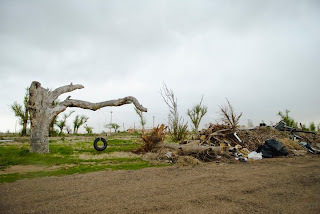 When Katie Bay and I visited the city a year after the tornado, we found that someone had pulled a tire and rope out of a debris pile, attached it to a debarked, twisted tree and made a swing. You gotta love it! In each edition, the Wall Street Journal runs a "human interest" story on its front page below the fold. About once a year, usually in spring, the paper runs a story about an attraction in Kansas. It looks like today's story is going to be about the World's Largest Hand Dug Well in Greensburg. The online link is here. (subscription may be required) UPDATE: Just went out to the driveway and picked up my WSJ and it is indeed today's human interest story. The town is recovering from an F-5 tornado that destroyed 95% of the city on May 4, 2007. The story discusses a proposal to build an upgraded well museum. I write about Greensburg in Warnings because of the 200+ lives saved by the meteorological profession that horrible May night. Plus, I've always liked Greensburg. It seems that just about every Midwest kid visited the well at one time or another growing up. My family visited on the way to our first-ever vacation to Colorado. 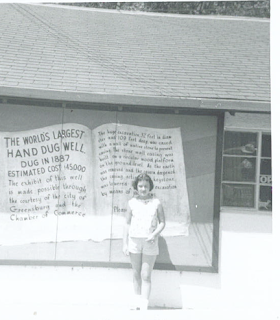 And, here is a photo of my bride-to-be, age 7, at the well. There was always a quirky aspect to the well that I loved. 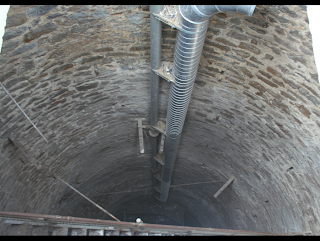 As the article points out, the museum was destroyed and the well itself was damaged. Only in Greensburg would you get a "decoration" like the one in front of what was left of the well a year after the storm. Photographer Katie Bay and I posed with the wire tornado. This is what was left of the museum building (background) with the well structure in the foreground. 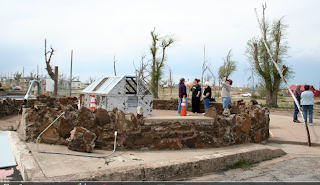 There was damage to the well itself because the extraordinary intensity of this tornado. So, good luck Greensburg with the new museum fund raising effort! And, stop by the next time you are headed through town. Here is the latest computer model forecast of freezing rain. The purple areas in Oklahoma may experience power failures with the potential that some areas could lose power for days. Click to enlarge map. Note also the new area of freezing rain forecast in North Carolina. The latest computer models indicate heavy snow, as well. The storm appears to be on a more northern path than earlier today. The highways in the ice and snow areas will be hazardous and there may be road closures even on the interstates. WeatherData's and AccuWeather's meteorologists are working hard on the latest forecasts. Please check with AccuWeather in the morning for the latest. My friend and AccuWeather colleague, Jesse Ferrell, has details at his blog. 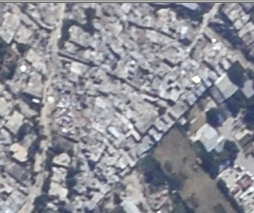 If you have been reading this blog, you know that I have been supportive of the U.S. and other nations' efforts to assist Haiti and counseling patience because giant relief efforts do not materialize overnight. On Wednesday, the day after the quake, we organized a relief team in cooperation with the U.S. State Department and Partners in Health (a Boston-based humanitarian organization) to provide emergency orthopedic and surgical care. We wanted to reach the local hospitals in Haiti immediately—but were only allowed by the U.S. military controlling the local airport to land in Port-au-Prince Saturday night. We were among the first groups there. Exactly the same problem, that is non-"official" relief on the scene immediately -- only to be prevented from operating by federal officials -- occurred in hurricanes Andrew and Katrina. I write in the manuscript for Warnings that officials seem to "prefer organized suffering to disorganized relief." I continue to believe the immediate priority is to get relief to the Haitian people, then there will be plenty of time to study and learn from what went wrong. My fear is: we still will not learn and make changes for future catastrophes. Mother Nature seems to love very sharp snowfall gradients this year. Here is the latest projection from the National Weather Service's NAM model (note: I am not suggesting that this forecast is correct, I am just illustrating the problem that forecasters have with this weather system). Click to enlarge. The forecast snowfall gradient is more than 8 inches in 30 miles near the Kansas-Oklahoma border east into Missouri and in northern Arkansas! The problem is that, until we get to less than twelve hours before the snow starts, our science has no ability to accurately forecast that type of gradient. So, this is one of those situations where the forecast for your driveway could be significantly in error simply because the storm shifts 10 miles in either direction. As always, you'll get "The Best Weather on the Web" at AccuWeather. The Advance Reader Copies (ARC) of Warnings arrived yesterday afternoon and they look great. ARCs go to magazines and other publications that work months ahead so they can have their reviews ready at about the time of a book’s publication. It is the second-to-final edit of the book, the photos are black and white, and it is soft cover (the actual book will be hard cover with a dust jacket and will have a color photo insert). While Greenleaf, the publisher, and Fleishman-Hilliard, the publicist, will be sending out the majority of the ARCs, Kim and I will be sending some to our contacts the next few days. If you know a journalist that might be interested in reviewing, please leave us a comment or send us an email at speeches@mac.com . If you live south of U.S. 400 in Kansas / U.S. 50 in Colorado and to the north of the Red River, pay attention to the weather the next few days. Ice and heavy snow will move into the region, but it is too soon to pin down exact amounts and locations. Donna LaFramboise, the Canadian proprietor of the "no consensus" blog has tracked down 16 other World Wildlife Fund assertions in the IPCC reports that are supposed to be solely based on peer-reviewed science. She has also found Greenpeace assertions listed as peer-reviewed science. The lists are here. Hat tip: Watts Up With That. Whatever one thinks of the WWF and Greenpeace, they are hardly disinterested science. WWF and Greenpeace are political advocacy groups and their pamphlets are hardly "peer reviewed." My sense is that this is pretty much the end of the IPCC's pretensions. There are enough people on top of this now that, even with the American media's self-imposed blackout and the excuses they are making for the IPCC, that Congress will not move forward with cap and trade. It will also be interesting to see if the Congressional attempt to repeal the EPA's regulation of CO2 gains traction. UPDATE: Apparently, I am not the only person questioning the EPA's CO2 ruling in view of these revelations regarding the IPCC's non-peer-reviewed science. Article here. Note: I corrected the numbering on the posts. It is amazing how quickly Glaciergate has gained traction, in spite of the near total blackout by the U.S. media. Hitler + absurdity + over-the-top claims = a job for Mel Brooks! And, please, keep the comments coming. The carbon trading market is falling apart. Today's article from the London Guardian. A picture is emerging of a UN organisation apparently out of control, fixated on having the proper story ready in order to drive the agenda at Copenhagen. It appears from the outside that they may have realised that this was their last best chance, with skepticism rising and the economies of the developed world falling. There are serious questions about the historical temperature records as reconstructed by Mann and the Hockey Stick Team. There are serious questions about recent temperature records (like, where are they?) as put together by a climate fanatic (James Hansen, and I'm actually not being critical of him--he believes and is acting on his beliefs--I'm just not sure we should follow him), and the absent minded professor, Phil Jones, who knows he left the data around somewhere (did he check behind the sofa?) and anyways, he 'could probably reconstruct it, given time.' We have seriously inflated estimates of possible impacts of global warming. We have a head of the IPCC who has channeled serious funding to his organisation due to those inflated estimates. And we have the IPCC printing phoned in magazine interviews about Himalayan glacier melt as if it were peer reviewed science. We appear to be watching the monolithic titan of the institutional fight against global warming fall broken to the ground. And it appears to have been constructed of papier mache. And, Tom leads into what will be my next series, Daughter of Climategate, which will pertain to the manipulation of the temperature record. However, so much as been posted this weekend, I'm going to give us all a little time to catch our breaths. So, I'll start posting on the temperature scandal in a day or two. Earlier in this series, I wrote about the "scrubbing" of the NASA web site. Roger Pielke, Jr., has found another scrubbed site, details here. Who knows how many others might be out there? Earlier I wrote about why I usually put 'global warming' in "scare quotes." The purging of data without any note or notice, as if it hadn't existed, is the very antithesis of science. It is something straight out of George Orwell's Animal House. In the Q & A after I present my global warming speeches, I am often asked why this topic distresses me so. It is because I suspected global warming was corrupting science, a point that is indisputable in the wake of Climategate and subsequent scandals. As I posted in December, it is exactly the corrupting influence that President Eisenhower warned of in his farewell address. Here is a great essay, written in the immediate aftermath of Climategate, that explains why honest scientists are taken aback by all of this. of science (often called the “scientific method”) actually works. not protected from tampering or fabrication. believe in the results of climate science. Note: I apologize for the spacing. It looks fine in the formatting tool, but does not post properly. At the end of Post #3 I asked, "Where is the U.S. media? Courtesy of one of our readers, the answer is: Making excuses for the IPCC. He forwarded this Washington Post story from this morning with the headline, "U.N. climate panel chief: Error shouldn't derail global warming efforts in India." It goes on to quote IPCC head Pachauri, "chairman of the Nobel-Prize-winning panel" about the "mistake." Note it is mistake, singular. Because these posts are rather long, I'd like to summarize them for you. As you know, the IPCC holds itself out as the epitome of objective, peer-reviewed science. The first three posts have shown that the IPCC has stated, as scientific fact, non-peer reviewed materials from political advocacy groups on two occasions, in spite of being warned that the information was not scientifically correct. We also learned that the incorrect claim about glaciers (why some are calling this 'glaciergate') was intentionally used to influence political decision makers. Second, we learned that Dr. Pachauri has considerable business and financial interests in this matter. Third, we received independent verification that Dr. Roger Pielke, Jr.'s long-standing claim about the IPCC completely distorting his research is correct. The research determined that 'global warming' is not causing greater meteorological disasters. The IPCC not only misstated the conclusion of the research, but created a graph (no one seems to know where the graph came from) purporting to show 'global warming' = more disasters. The IPCC claimed the graph was from the original research paper but neither that graph, nor anything like that graph, was part of the original paper. Finally, we have seen that the pro-global warming group at NASA has "scrubbed" the glacier claim from its website without further explanation. So, I have to be amused when the Post refers to "error" in the singular and does not provide any of this other context in its reporting. 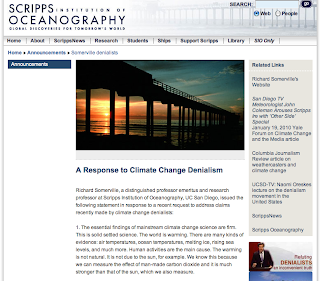 Scripps Institution of Oceanography has always commanded my respect. Some of the work of Jerome Naimas and Dan Cayan in the early 1980’s caused me to begin to understand El Nino and its effects on the weather around the world. Their work was the inspiration for a session that I organized, The Pacific and How It Affects Us, at an American Meteorological Society conference in 1985. So, it was with great sadness that I viewed the press release from Scripps this past week that signaled its transition from an institution of research to a political advocacy organization. of science in general and this great institution in particular. In my view, the content of the press release compounds problem created by its icons and headlines. It is the same old platitudes, starting with the first item. 1. The essential findings of mainstream climate change science are firm. This is solid settled science. The world is warming. Except, it isn't. Temperatures have flattened in recent years and, in any case, are well below the levels predicted by the IPCC. I won't bore you with a point-by-point refutation of the press release. Given Climategate, and still more recent questions about IPCC (the subject of the numbered series of blog posts that started yesterday), their press release is baffling and terribly disappointing. The news continues to break almost as fast as I can post. Here is the headline from the Sunday London Daily Mail. The story also acknowledged that the World Wildlife Fund, a political advocacy group, was the source of the nonsensical scientific "fact" and has claimed responsibility. As the IPCC and the "settled science" of 'global warming' continues to unravel, I pose this exit question: Where is the U.S. media? UPDATE: NASA is now covering its tracks. A second hat tip to Watts Up With That. It's been one disaster a week for a couple of months now. I said six months ago that it was time to bring some grownups onto the team representing the activist agenda for global warming. I said last week that I didn't think Pachauri would last until June 30th of this year. Looking around the warming blogs--like Real Climate, Climate Progress and others of that type--there seems to be no comprehension of the hole they are digging for themselves. Nor do reports in the major media reflect serious concern on the part of politicians who have championed the fight for so long. 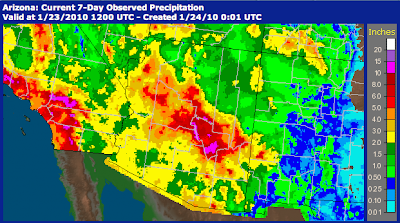 This map (click to enlarge), from the National Weather Service, shows the one week rainfalls across the Southwest. Note the areas with more than 15" in California! Los Angeles received nearly a quarter of its annual rainfall in one week. The news continues pour out of Europe with regard to what I have called (see post #1 below) the Himalayan Glacier Melt Fiasco and that some are now dubbing "Glaciergate." Before reading further, please read the post below. OK, thanks. Despite this change the IPCC did not issue a clarification ahead of the Copenhagen climate summit last month. The paper in question was requested by Dr. Roger Pielke, Jr. (full-disclosure, Roger is a friend and used to serve on WeatherData's board of directors). Roger's take on this is posted at his blog here. Some of us have known for years the IPCC's reports are not at all what they have claimed to be. With the Climategate and FOIA documents made public, many skeptics learned where to look for the evidence. There are going to be at least two, and possibly more, posts outlining what we have learned since Climategate. It isn't pretty. Since the Climategate document dump, a number of enterprising scientists have been following up the various inconsistences and questions those documents pose. More recently, a Freedom of Information Act request yielded many more documents from NASA’s climate group. So many charges and countercharges have been made, I have held off posting about them until I could take the time summarize them in a cogent manner. The first I will call the “Himalayan Glacier Melt Fiasco.” Turns out the IPCC, which holds itself out as the epitomy of peer-reviewed science, told us that the glaciers in the Himalayas were going to melt by the year 2035, just 25 years from now (found on page 49 of the IPCC synthesis report). What does the IPCC say now? The IPCC apparently sourced its forecast on a 2005 publication by the World Wildlife Fund. The WWF itself had picked it up from a 1999 magazine article based on a phone interview with an Indian scientist. In other words, it was hearsay from a political advocacy organization. Of course, this is an isolated error, a one time thing? Not so fast. Courtesy of Roger Pielke, Jr.'s blog is this guest posting by Ben Pile. In it, we learn that Oxfam's claim about drought in Africa due to 'global warming' that claims to be from the IPCC really isn't at all. Most interestingly, the study was not simply produced by some academic working in some academic department, for publication in some peer-reviewed journal. Instead, it was published by The International Institute for Sustainable Development (IISD). Oxfam takes its authority from the IPCC. The IPCC report seemingly takes its authority from a bullet point in a paper published by an organisation with a declared political interest in the sustainability agenda that was the brainchild of former Canadian Prime Minister Brian Mulroney in 1988. That the IPCC is citing non-peer-reviewed, non-scientific research from quasi governmental semi-independent sustainability advocacy organisations must say something about the dearth of scientific or empirical research. The paper in question barely provides any references for its own claims, yet by virtue of merely appearing in the IPCC’s 2007 AR4 report, a single study, put together by a single researcher, becomes “consensus science”. In other words, it is from another political advocacy organization. I'll have more about what Roger calls "laundered [scientific] literature" tomorrow. Stay tuned. Via Roger Pielke, Jr.'s blog is this thought-provoking essay written by Bill Gates regarding decarbonization and the best way to go about it. I agree with him that "a little more insulation" is certainly not the answer if we believe it is imperative to cut carbon emissions 80% by 2050. To me, that "imperative" is a huge "if." That said, I agree 100% that another 2" of insulation in every home will not come anywhere close to that goal and that the real answer is innovation. Fuel farming (i.e., growing crops with high energy yield), revolutionary increases in solar energy to electricity conversion, new and much less expensive nuclear power, the possibilities are endless and -- most likely -- the answer will be something we have not even thought of. This dovetails nicely with my thoughts about getting children getting children interested in science and technology expressed here last weekend. I am watching the "Hope for Haiti Now" telethon as I type this. They cut to Anderson Cooper a few minutes ago who, like so many, was complaining about the speed of the relief effort. 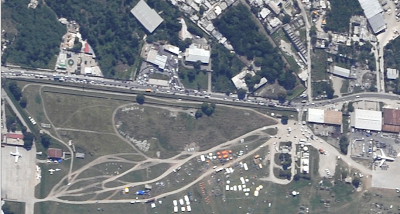 I have written about this before, but I would like to do so again with an aerial tour via Google Earth. apron and the runway. The apron is full of planes and there are a number of planes parked on the grass. The infrastructure does not exist to quickly move and unload aircraft. It may be that mistakes have been made and that things have not gone as smoothly as they might have. I don't know. But, given the logistics and the security nightmare (the need to protect the rescuers from attack), it seems unreasonable to expect to metaphorically flip a switch and have exactly the right resources in the right place within hours or even a few days. A quick addition. The telethon just made another reference to the speed of food relief in a pre-recorded piece. The thought just occurred to me that might help put things in perspective: Per a Google search I just did, the Telethon was announced on the 17th. Yet, it is taking place five days later. Fair enough. But, if it takes five days to organize a telethon staged in Los Angeles, the city of residence of many of the performers, one can see why it took days and will take weeks and months for the relief effort to fully gain traction. I don't, in any way, mean to denigrate the telethon. My point is that big efforts simply do not occur overnight. Here is the story of a young boy swept out of a pickup truck and presumed drowned in the Arizona flooding yesterday. It is a cautionary tale about the danger of driving into a flooded area. It is never safe to drive into a flooded area, particularly if the water is flowing. You never know whether the road has been undermined or has washed away. As the National Weather Service says, "Turn around, don't drown." The new hospital has opened. 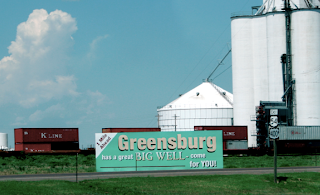 Congratulations, Greensburg on your great progress! At left is NOAA's 30-day temperature forecast for December, 2009, and, at right, are the actual temperatures for December (click to enlarge). You'll note the location of the warmest forecast temperatures (burnt orange colors) was where the coldest temperatures actually occurred (purples). This forecast was made in mid-November. The British Met Office, which uses a different technique than NOAA, also missed badly. Their miss comes as part of a string of terrible forecasts that has caused some to question whether the Met Office should get out of the long range forecasting business. My experience with the NOAA and Met Office forecasts seems to indicate little, if any, skill and I can see the point of some critics to take these back into experimental mode until consistent skill can be demonstrated, which might be years in the future. That said, if we can't get the 15 to 45 day forecast correct what makes us think we can forecast the climate 50 months or 50 years into the future?! I'll have more on the topic of confidence in long range climate projections later today or tomorrow. Roger Pielke, Sr. is both a meteorologist and the former state climatologist for Colorado. He has some comments in an illuminating article pertaining to an article in Nature. 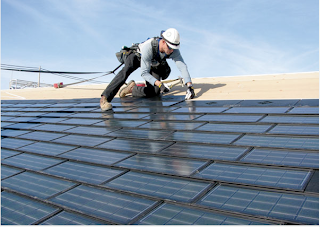 These are Dow Chemical's new solar power shingles. They can go on an ordinary roof using ordinary building techniques. As costs continue to come down for solar, it becomes a more practical alternative. My only question is how they would do in a hail storm. I have emailed Dow and will let you know if I get a response. 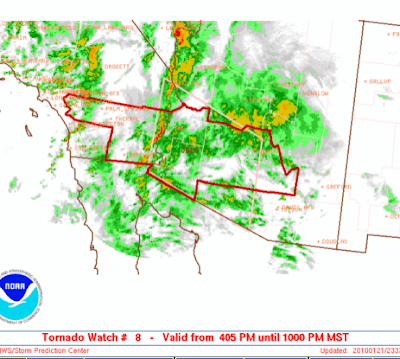 A tornado watch for southeast California and Arizona. UPDATE 5:43pm: Tornado Warning near Blythe, California! Average flight delays more than 3 1/4 hours at Las Vegas. Southwest Airlines has grounded flights until 8pm Central time in the area due to high winds and thunderstorms. AccuWeather has a special video report here. Update, 9:45pm: There was indeed a tornado that crossed I-10 at Blythe blowing over semi's and causing other damage. Winds gusted to 94 mph at Ajo, Arizona. A tornado warning was issued for the Scottsdale area. Radar indicated a nice swirl in the area (see image below). The governor of Arizona has declared a state of emergency for the entire state. 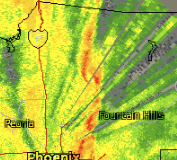 The swirl is near Scottsdale and is in the image east of I-17 and above the "F" in Fountain Hills. We now have reports of a tornado at the Desert Ridge Marketplace Mall in Scottsdale. This is across the street from the large J. W. Marriott Resort. Glenn Reynolds makes excellent points about having several days of food and other supplies at your home in case of disaster. Given Katrina and the Haitian earthquake, this advice is especially timely. Kate Bilo and I do a joint video report at accuweather.com. Reports of tornado damage in northeast Texas. 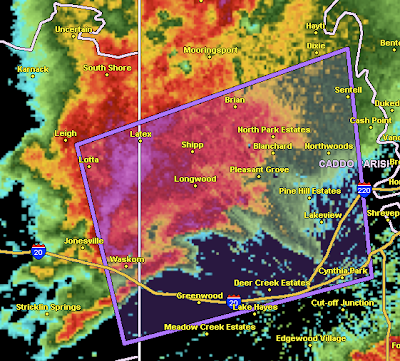 Here is the hook echo when the tornado crossed I-20. A hook (light purple color) is a strong indicator of a tornado. The fishhook-shaped echo indicates a tornado just north of Waskom, TX. The damage was reported within minutes of this image. PLEASE PAY ATTENTION TO THE WEATHER DURING THE NIGHT IF YOU ARE IN A TORNADO WATCH! UPDATE: Tornado watch #2 has been issued westward to include the Dallas-Ft. Worth Metroplex. 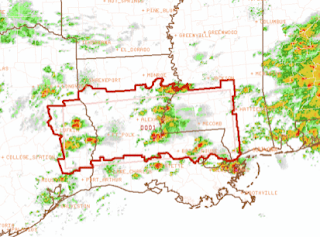 The first tornado watch of 2010 has been issued for the area outlined in red. I bring this to your attention because people are typically not thinking "tornado" this time of year. 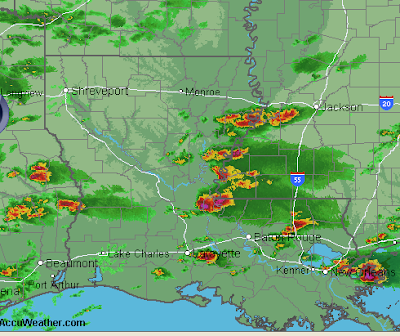 Radar at 3:58pm Central already shows strong storms with tornado warnings already issued. Please pay attention to the weather in this region.